Stunning compact mixer brings SSL big console sound and features to your desktop. 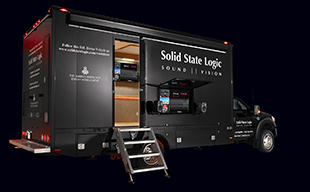 OXFORD ENGLAND Solid State Logic announce the launch of SiX - The Ultimate Desktop Mixer. SiX is a classic SSL design, with a carefully considered feature set that is driven by an obsessive desire for total flexibility, to encompass every creative eventuality. It carries the DNA of 40 years of true expertise in creative studio workflow. Listen to SiX and you will experience the impeccable sonic performance that is the hallmark of every SSL console. It is powerful, intuitive, inspired and rewarding. As a condensed professional console for use in the studio, in post-production, on stage, and for podcasting, SiX offers big console sound and an impressive set of utility features in a format that is small enough to stick in a bag. SiX is stunning value; it offers two recording channels with SuperAnalogueTM mic pres, an essential one knob version of the classic SSL Channel Compressor, a new two-band Channel EQ, inserts and 100mm faders. There is a two-knob version of the legendary G-Series Bus Compressor on the main mix bus and the unique Listen Mic Compressor on the Talkback. In mixdown mode it is a very capable twelve channel summing system that offers analogue detail, depth and width to your mixes. “With over 30 years’ involvement in the design of SSL consoles, when developing the concept of SiX, I really thought hard on what our users appreciate about our larger consoles; what helps their workflow and delivers quality results for them” comments Niall Feldman, SSL Director of New Products. “The big challenge then was how to deliver those values and features in a compact product. Working with a great team and focussing on audio quality, workflow and flexibility, the resultant SiX mixer is one our proudest achievements”.